This was exactly whar we needed! This allowed our heat to blow through from under our couch! We now get the heat to us instead of the dresser! 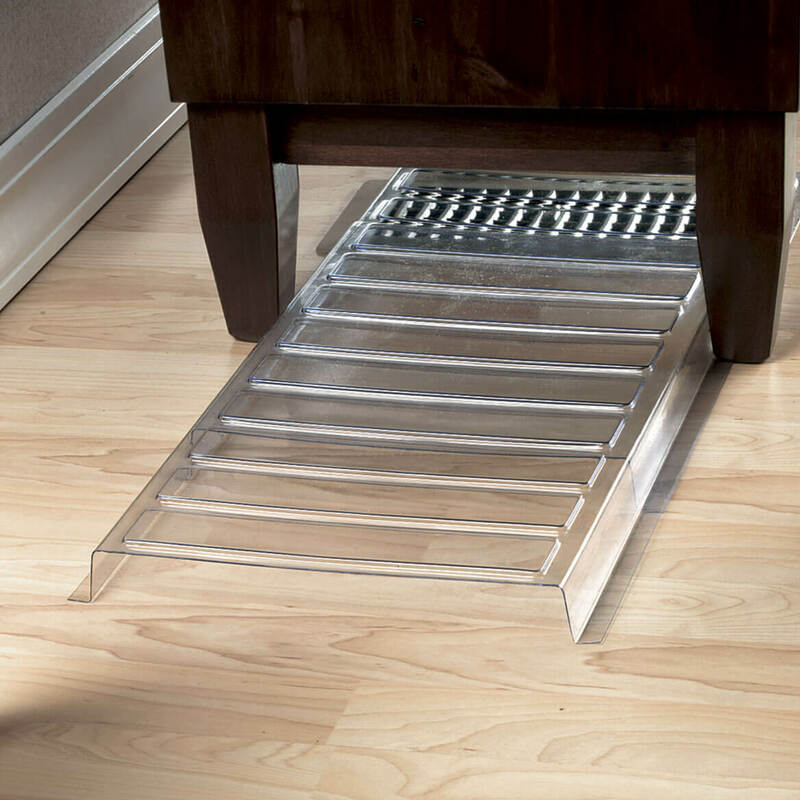 This is a great product idea when a furnace vent is under furniture. I use clear packaging tape. Apply tape to the extender. Lift the vent slightly and fold the tape underneath. This keeps the plastic extender from shifting out of place. Great for directing air, but need to come with double faced adhesive to keep in place when cleaning under sofa. Had a wall vent that is behind new shelving unit with doors and needed to figure out how to vent air up the wall above the doors. Surprise! With a little two sided tape, and a plastic vent cover to adhere to metal vent as a starting place, it works like a charm. Just had to notch out shelf to accommodate the depth of the piece. I was able to go up two feet....SWEET! Great for under couch or chair so you don't have to move them in winter because of the vent. It doesseem to work well. small room minimal places to move furniture. This product allows me to more avenue's without compromising the heat distribution in the room. We had to do something about heat not being able to warm our family room becaosr there was only one place we could put our large sectional & that was in front of the heat vent. We tried other things that did not work well! This fits perfect,is long enough & carries heat out exactly like we were hoping! The only bad part-it came cracked, but we realy needed it now!, so we duck taped it together-perfect! My always cold family room has become much cozier thanks to this product, extend a vent. The only wall able to accomodate my sofa, also contained a heating vent. "Why heat the underside of your furniture" really hit home. As soon as the device was in place, the difference was noticible. Thank you for this wonderful idea! we are using it under an hope chest. I use this under my buffet and what a difference it makes. I actually feel the heat now. It's incredible how a small, inexpensive item makes such a big change. Who knew?! I would buy thus again.. it does what it's supposed to. I have looked everywhere for something like this! I have a couch and a sofa table blocking the only heat vent in my living room, with this vent extender I can actually feel the difference it makes. It allows us to re-arrange furniture during the winter/holidays. Vent on floor where couch is and vent under bed. This vent extender works great on getting the heat into the room. Great vent. This is my second purchase of this vent. I really did my homework on this one!This was the CHEAPEST price around for this item.I checked no less then 15 other places for this.I live in an older home with 1 heat vent in my bedroom.The ONLY place to put a dresser is ,you guessed it,right in front of the heat vent.This gadget let me put my dresser where it belongs and still use the vent.PROBLEM SOLVED for under $11! Under dresser, sofa, chairs. I'm going to order another one. I needed this for my living room vent. It's a tad too short to cover the vent totally, but that's ok. I'll cover the excess with something else. That's the only reason I gave it four stars. The vent has been in place for a few weeks now and does exactly what I expected of it. I've no complaints and would buy another one if I had need of it. I was a little dismayed when I opened the package, as this seems very flimsy but the vent extender works just fine under my couch. This makes a huge difference! It's great to have a blocked heat vent become useful again. good idea to extend heat register heat from under furniture but is too close to the floor. It needs to be a little higher off the floor. if your heater puts out strong force of air, liftgs off the vent. could use some magnets, or something to fix it so it will not left as if it was flying. it's just a couple pieces of plastic. I suppose it pays for itself by being an efficient heat diverters. A little flimsy but works especially well where curtains cover vents. It fits on the vent under our dresser and lets the air out into the room. I currently am using it under an entertainment center. It has made a big difference in the temperature of the room by blowing the heat out from underneath it. The extension length is great, I only wish it was wider so it would cover the entire vent. I used this under my couch. Works perfect. This extender channels the heat under a couch, chair or piece of furniture. It does work, I have concerns about how long they will last. This would have worked but the vents I have are on the wall.near the floor and the actual vent opening are on the upper part of the vent but not next to the wall. I bought this to use under my bed to bring the heat out farther in the room. Wish it was a better fit and have magnets on the edge so it will not move. It does work in getting the heat out from under the bed. These vent extenders work great! It would be helpful if they came with magnets to attach to vents. I just used the peel and stick magnets for crafting to attach the extenders to the vents. The ticket for a small house! After reading reviews I ordered this product anyway, having great need to re-direct air flow from vents. This product works just as described. Caution must be utilized however. 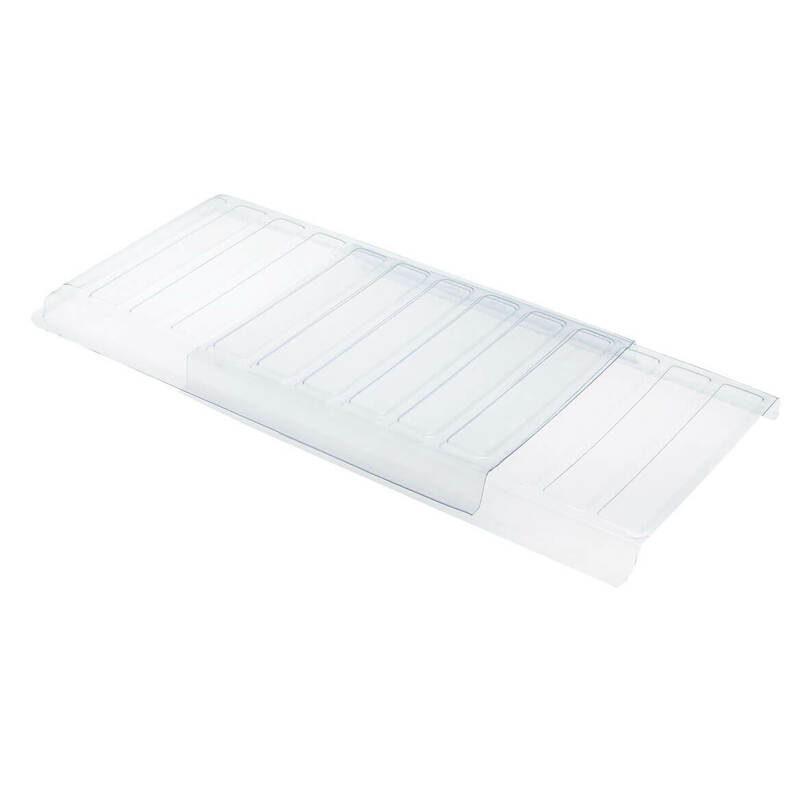 This item will not withstand any weight whatsoever as the material is not the hard plastic normally used to construct air vent covers. If the product will be covered by furniture, if it won't be placed where it will accidently be kicked or stepped on, it will work out ok. The product still provides the service described. And that's good enough for me. :) It's not meant to be decorative . Perfect solution to an age old problem. I was able to place my entertainment center where I wanted it because of this product. The extender nests into place so it stays at the length you have chosen. I had to shorten mine which was easily done with scissors. The clear plastic helps to keep it from being noticed. The only drawback is that it doesn't attach to your vent which means the entire unit could be displaced. I used a magnetic air deflector on the vent and tucked this product into the deflector. Works like a charm! Nice solution for those "inconvenient" air registers.....no more hot, dried out wood furniture, or having to relocate furniture for the cold months of the year. I love the vent extender! I have an ottoman in my clothes closet that blocks the floor vent...so this is just perfect to get the air to flow out from under the ottoman! I didn't know it existed till I saw it in your catalogue. Good for vents blocked by furniture. Now the heat comes out from under the furniture. The house is warmer. Only problem is the width. This does not cover the width of my vents. It is short by 2". It really does deflect the heat/cool air from under my furniture. Walter Drake is the only store that sells this item...I could not find it locally! I'd like to see it offered in an adjustable or fixed widths! I used the vent extender under larger pieces of furniture and they seem to work exactly as you would expect. The width could be just a bit wider to fit better over the existing floor vents , but for the most part they get the job done. Good value for purpose, exactly as appears in ad & pic. It's not wide enough for the vent I needed it for (my vent is unusually wider than average) so this shouldn't be a problem for most other users. I was still able to use effectively by doing a little improvising with a strip of the same color of vent duct tape to cover 2 inches of the vent service to meet the vent extender at its width stopping any air from coming out those 2 inches thus forcing out all air from the exact width of extender needed to be truly effective. My vent is also underneath & behind a piece of furniture so I don't mind so much the duct tape & it actually does not look bad at all bc the tape is same color as vent & blends in nicely. You really cant tell its duct tape & its serves the desired purpose to save energy & divert air in more effective areas. Glad I was able to still use & I would purchase again if needed. I was sort of iffy about buying this product. I don't care to buy something without looking it over first and handling it. I wasn't sure if the plastic would be breakable or sturdy. I was pleasantly surprised that the plastic was much thicker and sturdier than I had expected. I bought two just in case. Installed it very easily and now I'm no longer wasting money heating the underside of the couch. I bought these to go inside the toe kick register in my kitchen to facilitate better air flow through the register. Looks like it will be perfect under a cedar chest. Great idea to redirect heat. I could use these for the heat distribution under the couch and beds. I have 2 furnace vents that have items over them, and I need to direct the heat outward, not straight up. IT WILL HELP KEEP ANTIQUE FURNITURE OVER VENT FROM DRYING OUT AS MUCH. I have a wooden bench over my vent. No where else to put the bench. Want to keep the heat away from my bench. Need to channel register air from under a couch. The home I am moving into has the vents on the floor. I do not want to be limited to where I place the furniture. This will fit perfectly in my closet under the lower clothes rack. Didn't work well. Gets moved out of place too easily. Good idea, but if it had magnets like the other deflector did, it would work better. A great concept, but it doesn't stick to the wall despite using different tapes or Command strips. I needed something to redirect the heat from under my Entertainment cabinet. Great item to extend furnace vent blowing out from under the chair. My floor vents are under a small dresser. This brings the heat/cool air into the room. It works great! My vents are under my dresser and under my bed; I hope to move the air out into the room. need one for under couch to direct heat out from under it. The furnace vents will work in the places I need them . This is just what we need for underneath a cedar chest in one of our bedrooms. I chose this so I could put it on the vent under our sofa so it will divert the airflow from under the sofa rather than heat the sofa. Due to the size of a buffet, the place I need to place it covers a heat/ac vent. I wanted to help move the air out from under the buffet. would like to rearrange my furniture but it would block my air vents. now I can move things around. have been trying to find these extenders for a long time. These are excellent for solving issues of furniture being placed over heat vents!! They are so unique and functional!!! Had vent under a night stand and needed the heat/air conditioning to be deflected. They are not adjustable for width, so it doesn't fit my vent properly, but still usable. to use under a bed. I purchased this item to move the heat from under my sofa. how does it attach? With magnets? BEST ANSWER: Thank you for your question. The item is made of 100% plastic and sits on top of your vent. We hope this information will be of help to you. magnets on the vent and double stick strips on the extension on the floor. How far does it extend out? BEST ANSWER: Thank you for your question. It expands from 20" - 36" and is 11"W x 1"H. We hope this information will be of help to you.